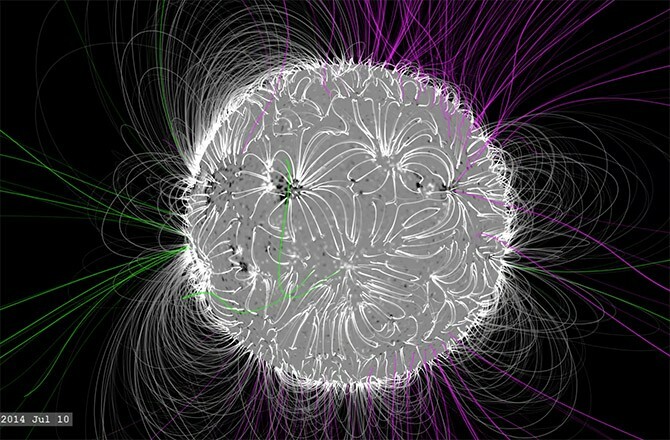 The sun's tangled magnetic field is seen here in this Potential Field Source Surface, or PFSS, visualization of the solar corona during solar maximum. Some of the greatest cosmic mysteries are closer to home than you may think. Take our sun: it is the energy source for all life on Earth and it generates powerful flares and coronal mass ejections that energize interplanetary space, igniting beautiful aurorae at high latitudes on our planet. However, the sun has a perplexingly hot atmosphere that, until recently, we had little idea as to how it was heated. Now, with the help of complex computer simulations supporting sophisticated observations, these long-standing mysteries are slowly beginning to unravel. Central to the engine that drives our sun is its dominant magnetic field, which heats the multi-million degree solar atmosphere, known as the corona. Like the glowing filaments in an electric fireplace, magnetic field lines pop from the sun’s interior and reach high into the corona. It is thought that these dynamic loops of superheated plasma, called coronal loops, form the basis of coronal heating mechanisms. These fieldlines are highly dynamic and wax and wane in activity according to the sun’s 11-year cycle. For reasons poorly understood, the sun’s internal dynamo becomes increasingly stressed over an approximate 11-year long period, during which solar activity ramps up and then spikes around a period known as “solar maximum.” Space weather forecasters predict increased magnetic activity, which triggers clusters of active regions and inevitable dark spots called “sunspots.” Massive solar eruptions that can affect our planet peak during this time. And this is why attention is being paid to the sun. Our high-technology civilization depends on an armada of communications satellites and we are increasingly addicted to globally-connected gadgets that manage our everyday lives. Should the sun blast a powerful CME in our direction, which is composed of a bubble of highly energetic particles, it can ripple through our planet’s magnetospehere, neutralizing satellites and overloading national power grids. (If you think the latter sounds like science fiction, look up the 1989 Hydro-Québec’s power outage. These events happen.) Suddenly cities go dark and Facebook notifications are silenced. To understand the hows and whys behind the solar cycle, the energetic processes that drive powerful flares in the corona and their impacts on Earth, we must understand how the sun’s magnetism is generated in the first place. And as it turns out, our knowledge in this area is a little sketchy. Like any astronomical study, more data is always needed and now we have NASA’s Solar Dynamics Observatory working in conjunction with other solar telescopes and space weather observatories, to see the dynamic sun in more detail than ever. But to interpret these observations we need complementary computer models that use known physics behind the solar corona to explain the phenomena we see. This leads to a better understanding of the sun’s environment and can help space weather forecasters predict when and where the next big solar storm will hit. In this video, the Potential Field Source Surface, or PFSS, model is showcased by NASA Goddard’s Holly Gilbert, Deputy Director of the Heliophysics Science Division. Models such as these help solar scientists understand how the sun’s magnetic field evolves, even providing a simulated view of the sun’s far side. Although we are far from fully understanding how the sun’s dynamo works, we are acutely aware of the angry ball of magnetized plasma it can drive and solar physicists are continuously closing in on better models and better ways to predict when the next big solar storm will slam into Earth.